Janet Varney is an Emmy-Nominated actor, comedian, writer and producer. She played the award-winning voice of Korra on the Nickelodeon hit The Legend of Korra. She co-stars on the IFC show, Stan Against Evil and the FXX comedy You’re The Worst. She was the host of the beloved TBS show Dinner and a Movie and was a regular on the series Burning Love. Cole Stratton is an actor, improviser and writer based in Los Angeles. You may have seen him on the TV shows, American Horror Story, Nash Bridges, and Good Girls. He writes and performs comedic commentary for films on RiffTrax.com, an online venture helmed by the creators of Mystery Science Theater 3000. "Pancakes" - Featuring guest improvisers Phil LaMarr, Stephanie Courtney, Gary Anthony Williams and Tawny Newsome. Recorded live at the Westside Comedy Theater. "Bobcat" - Featuring guest improvisers John Michael Higgins, Tawny Newsome, Oscar Nunez and Gary Anthony Williams. Recorded live at the Westside Comedy Theater. "Women's Rights" - Featuring guest improvisers Scott Adsit, Lucy Davis, John Ross Bowie and Gary Anthony Williams. Recorded live at the Gateway Theatre. "Unicorn" - Featuring guest improvisers Phil LaMarr, Stephanie Courtney, Gary Anthony Williams and Tawny Newsome. Recorded live at the Westside Comedy Theater. "Nickel" - Featuring guest improvisers Tawny Newsome, Seth Morris, Brian Huskey and Edi Patterson. Recorded live at the Westside Comedy Theater. "Fountain" - Featuring guest improvisers Phil LaMarr, Stephanie Courtney, Gary Anthony Williams and Tawny Newsome. Recorded live at the Westside Comedy Theater. "Brisket" - Featuring guest improvisers John Michael Higgins, Tawny Newsome, Oscar Nunez and Gary Anthony Williams. Recorded live at the Westside Comedy Theater. "Lawn" - Featuring guest improvisers Scott Adsit, Lucy Davis, John Ross Bowie and Gary Anthony Williams. Recorded live at the Gateway Theatre. When you add The Bat to your library, you'll get all 8 episodes, each with a runtime of about 18 minutes. It Took Just One Episode . . .
. . . to tell me I didn't want to listen to any more. It took a second to remind me that sometimes you can rely on first impressions. While I'm not the brightest bulb in the firmament I didn't need a third. 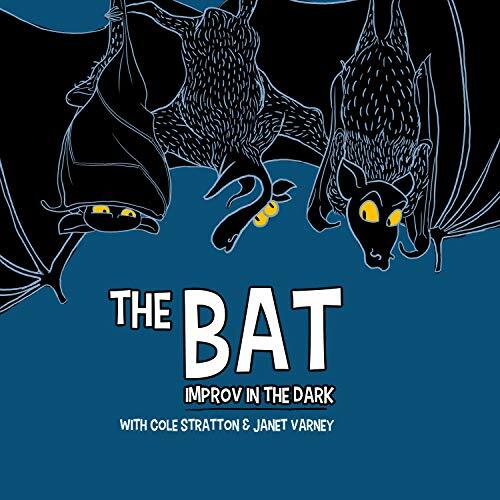 In a way an improv show performed in the dark is an interesting idea and the actors do keep the momentum up quite impressively but, it just isn't funny. So American. “OH MY GOD” in Janice’s voice from friends pretty much sums up the comedic value of this audio programme. I was very disappointed in the comedy and even more so in the delivery. A narrative is hard to accomplish in improvisation, and it took less that 10 minutes for me to realise this wasn’t my type of comedy. Poor, unfunny, and painful to listen to. I had to stop listening before the end of the first episode because it was just depressingly bad. None of the jokes landed and the whole thing was just awkward. I feel sorry for the live audience. Sorry, I'm sure Americans love this but I find it difficult to understand. This is because I am from the UK.